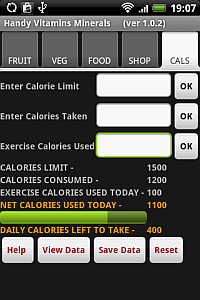 Below is the CALS screen which enables the user to enter a Daily Calorie Limit, Daily Calories Taken and Daily Exercise Calories Used. 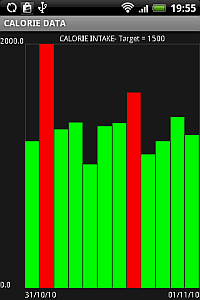 This value should remain the same for the duration of the current calorie monitor session as it will be displayed on the Graphs with Calories Taken below this value in Green and values above this as Red. This is a daily cumulative value. When Ok is pressed the value is added to the existing running total and displayed as CALORIES CONSUMED. This is a daily cumulative value. When Ok is pressed the value is added to the existing running total and displayed as EXERCISE CALORIES USED TODAY. This value is also displayed as Green on the progess bar and is the Calories Taken minus the Exercise Calorie Used. 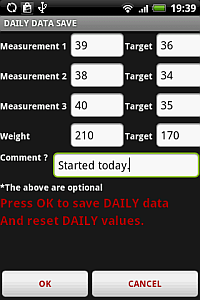 Below is the Save Data screen which enables the user to enter daily measurements, weight, targets and a comment. 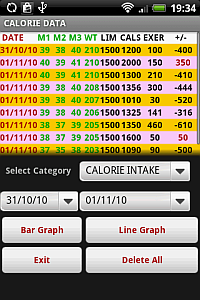 The Targets should remain the same for the duration of the current calorie monitor period as they will be displayed on the Graphs with readings below the target in Green and values above the target as Red. The Measurements 1,2 and 3 are decided by the user as are the units for the Weight (Note that all these values are optional and you do not need to enter any values if you do not wish to). When OK is pressed all the above values are saved together with all the Daily Calorie Values on the CALS display. * Note. In reality all dates will be different.Here they are the same for demonstration purposes. You can select a category eg CALORIE INTAKE and the start (left) and end (right) dates to view as a Bar Graph or Line Graph. This Bar Graph shows the values for daily CALORIE INTAKE between the selected dates. Those over the Calorie Limit are in red and those under the limit are in green.